Most of the time, artists admire the sources of inspiration from a distance. Many are already dead. Lucky are we who have a chance to work, even briefly, with the master. 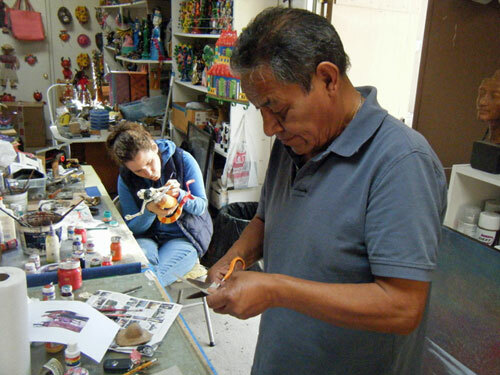 Yesterday I was able to spend a couple of hours with the artist who has carried on a family tradition of celebrating the Day of the Dead in papier-mâché, Joel Linares. His calaveras, or skeleton tableaux, are world famous. A few times a year, Joel trades his studio in Mexico City for one in Pasadena, hosted by Rocky Behr of the Folk Tree. Anyone can sign up for a class. Joel is generous with his time and his expertise. I was all thumbs in his presence, but did pick up a few nifty tips along the way (for example, wrapping wire with masking tape for really thin, strong appendages). Still, the paste is still just flour and water, and the paper is just newspaper and craft paper. It’s all in the doing. 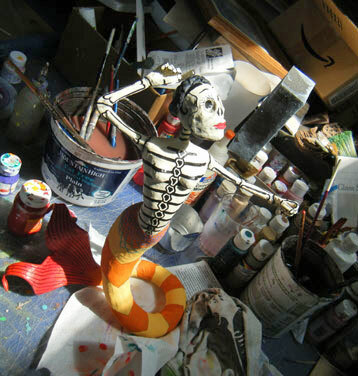 Check out La Sirena (the Mermaid) being born in the studio–a collaboration of Joel Linares and Sarah Davis over many, many sessions. All pure joy for the creators.